Brilliant! Absolutely delightful. 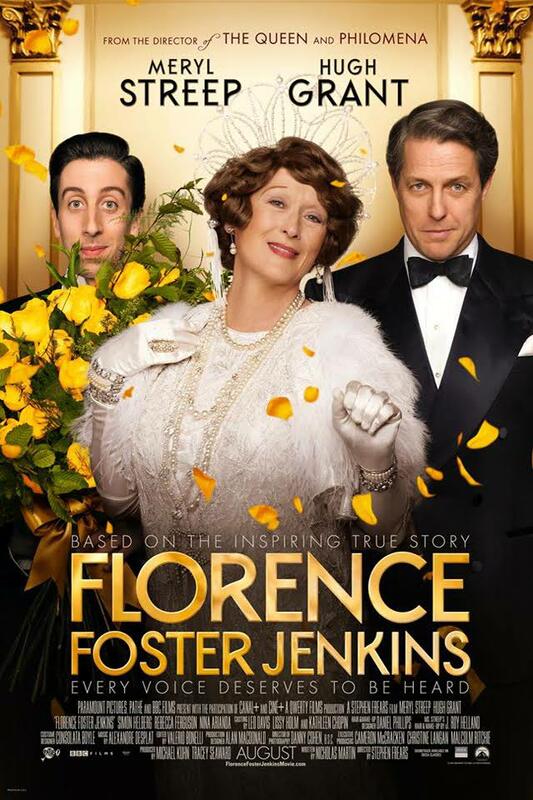 Paramount Pictures and BBC Films proudly present a magical film about one of the most legendary musical talents Madame Florence Foster Jenkins. This is the perfect film for the times that we live in. Just when so often we hear news about the worst in people, this film is about the best that people can be. Whether you are a musician or vocal artist yourself or simply appreciate the beauty of music, you will undoubtedly find this film fascinating and endearing. Meryl Streep provides audiences with a command performance as Jenkins, and will have you rolling around in your seat. Like classical music? This film has it. Prefer big band or jazz? This film has it. What about opera? It has that too. I doubt that there are many people as committed to the art of music as Jenkins was. One part musical and one part dramedy, Florence Foster Jenkins is a crowd-pleasing work of cinematic excellence. From brilliant writing to phenomenal acting, this film is a must-see for music lovers. Who would have known that someone with such a unique voice would have sung herself into the heart of millions. This film has a little something for everyone, especially those who are in the creative fields. May this film be an inspiration to all those who have drive, passion, a love for, and are dedicated to the pursuit of the arts, and open up that world to those who may not otherwise be able to experience it. Not sure what’s bigger…Jenkins’ heart or her stage presence. Whatever the case, this film is definitely one to catch on the big screen! Return to New York City in 1944. Amidst the glitz, glamour, and sound of the very heart of the performing arts is a story of laughter and tears, but most importantly about a true unconditional love for both music and our friends and neighbors. Meet Florence Foster Jenkins (Streep). She is a well-known New York socialite who is a dedicated patron of the arts, specifically music. She has transferred her love of music to a love of bringing people into her world. With ambitions dreams of becoming the next great opera singer, she records albums and books Carnegie Hall. There’s only one small problem; unfortunately her ambition is only succeed by her lack of an ability to carry a tune. In her head, she is an absolutely incredible talent. However, to everyone else, she sounds laughable. It matters not! She is determined to showcase her love of music to the world. Giving away 1000 tickets to military service members, she plans to fill the hallowed halls of Carnegie with the sounds of music and love. Her husband/manager St. Clair Bayfield (Hugh Grant) and accompanist Cosme McMoon (Simon Helberg) both stick by her as she plans to take Carnegie Hall by storm! Together they embark on a legendary journey that is still talked about and listened to today. It’s so hard to know where to begin. There is quite possibly no film that truly captures the love of music and our fellow man nearly as remarkably as this film. Truly inspirational. From the writing, to the acting, to the sound track, it is a flawless story that is definitely best experienced on the big screen for Jenkins was truly a larger than life talent herself. You’ll laugh, laugh some more, and even cry a little. In many ways, this film fits the drawing room comedy subgenre of films. There are very few set changes, it is mostly dialog driven, and features various forms of comedy all working together to support a light-hearted film about the love of music. Instead of taking place in the drawing room of a home with a dynamic set of manners and social criticisms, this film takes place mostly in the homes of Jenkins, Bayfield, with a visit to the humble abode of McMoon. There is one common thread between all of them, there is either a piano or other device playing music that greatly affects the narrative. Paralleling real life, you have the grand piano in a magnificent Manhattan apartment belonging to someone who cannot play or sing very well–anymore, anyway. There is the basic, beat up upright piano in the home of a wonderfully talented pianist. And finally the home of the one without much talent at all who makes a better manager, there is a radio. Three different characters who seem to come together in the most brilliant of fashion. Each with a different part to play in the grand scheme of things. I greatly appreciate the film for keeping the focus on the love of music and not on the comedic flat, sharp, and howling notes of Jenkins’ voice. As we are on the cusp of Oscar season (typically beginning in October), Streep’s portrayal of the, say, Ed Wood of opera singers could very well give her an Oscar nom. Making it her 20th! I don’t think there is anyone who could have played the roll as well as Streep. Yes, Strep is–no surprise–excellent at everything she does; still, there are roles that even surprise us. This is definitely one of the latter. When exploring the eccentric character of Jenkins, I am reminded of a character that is essentially a Norma Desmond of sorts. A faded star who refuses to admit her years and has extreme determination to return to the silver screen, or in this case, the stage at Carnegie Hall. Other than the inspirational message and creative storytelling based on actual events, I greatly appreciate the characters of the movie. Seems as though that Jenkins, Bayfield, and McMoon were made for each other. All unique in some form or fashion, depend on one another to achieve goals, and are more talented in their respective heads than in real life. Except. You cannot really say that about McMoon. He is definitely aware of his talent, but is so incredibly timid, shy, lacking confidence that he has extreme difficulty in allowing his talent to flourish. Much like Jenkins, Bayfield is a dedicated actor. Unfortunately, he too is much more talented in his mind than on the stage. Comedy is born out of conflict, and this beautiful film has plenty of conflict with which the characters to engage one another. This film also highlights how incredibly devastating one critic’s review of a performance can be. Whether we are exploring film, theatre, music, or literature, a critic for a high profile outlet can make or break dreams. There are two kinds of critics, speaking as one myself. There is the critic who is so fixated on the technical components or surface level performance that he or she misses the soul of the performance or movie. Not that having a beautiful message overshadows poor production quality. However, there is a delicate balance that is important to strike to truly review or analyze a creative work. Did Florence Foster Jenkins’ performance accomplish what it set out to do? Indeed it did. Was it effective for injecting laughter into the lives of the soldiers and Manhattan music patronage community? Absolutely. She was and is truly a legend of incredible talent. Maybe not in the conventional sense, but she left a lasting impression that has captured the imagination and attention of the world for decades. Director Stephen Frears successfully applies his vision of the story of Jenkins and translates it to the screen in a way that will inspire you to perhaps continue to pursue your own dreams no matter how much talent, or lack thereof, you have. Don’t allow this movie to quietly slip by. Definitely catch it in theaters because Simon Helberg introduces the film and there is a behind-the-scenes/Q&A with Streep, Grant, and Helberg following the old-school credits.